It's almost the end of the month and that usually can only mean one thing - it's time to join the Daring Bakers and our adventures in baking. This month it was the lovely Quellia of All Things Edible who was supposed to choose our challenge. As always we waited impatiently for the June's challenge to be posted on the Daring Baker's blog. After May's challenge I admit I was feeling invincible and was on such a high as I had conquered and tamed a few tough processes in every pastry chef's career. Then the hammer fell! Quellia spilled the beans ... or should I say the bagels! She had chosen pure, honest, Jewish bagels, just as they are supposed to be made, as our challenge. My first thought: "UGH!! Yeast - all that kneading and rising!!" I am not a bread/dough maker - avoid it whenever I can and with the exception of pizza dough never wanted anything to do with yeast. But I am a Daring Baker, so I rolled up my sleeves and decided to take the challenge on. I decided to do this early on in the month as I had the perfect occasion - my birthday! There would be many guinea pigs around for me to try this challenge on! Topping of our choice, savory recommended, for the outside of the bagels only. No added ingredients or flavours inside the bagels. Recipe ingredient exception allowed only if allergy or an ingredient is not available or cost prohibitive in our region. So, what are real, honest, Jewish bagels? Most of us know that bagels came to the US from the Jewish shtetls of Eastern Europe, however the exact origin of this roll with a hole in the middle cannot be pinpointed. Legend has it that the first bagel was created in 1683 when a baker in Vienna wanted to pay tribute the Polish King Jan III Sobieski for saving the people of Austria from Turkish invaders. Since the king was known to have a passion for riding, the baker made rolls in the shape of a stirrup, known in German as beugel. The roll soon became a hit throughout Eastern Europe. In the 1880s as hundreds of immigrants of Eastern European Jews came to New York, they brought the bagel with them. They were widely sold throughout the city, with the vendors threading the hole-shaped bread onto dowels and hawked them on street corners. Then in 1907 the International Bagel Bakers Union was founded in New York City. The members of this group fiercely safeguarded the recipe for bagels. These were usually boiled or "kettled" in vats of boiling hot water before baking. Traditionally the bagel bakers worked in teams of four, two men making the dough and shaping the bagels, one boiling them and the fourth baking them. After World War I, Meyer Thompson, the son of a bagel baker in Winnipeg, Canada experimented with several bagel baking machines in his workshop above the family bakery. None of the models he invented actually made it as they all had major flaws. However, in the 1960s his son, Daniel, picked up where his father left off and finally invented the Thompson Bagel Machine. This machine was capable of making 200 to 400 bagels an hour, causing the bagel to enter mainstream America with such popularity that within a few years bagel consumption in the US skyrocketed. Unfortunately the tradition of hand formed bagels virtually vanished as did the purity and simplicity of the roll. Bagels are now available with all kinds of flavors added to the dough and are frozen in large packs available in supermarkets around the world. This probably makes the old members of the Bagel Bakers Union shudder in their graves. But here we are, a group of Daring Bakers who have decided to take bagel baking back to it's old tradition. No added flavors, no machines and 100% hand made. Pour three cups of hot water into the mixing bowl. The water should be hot, but not so hot that you can't bear to put your fingers in it for several seconds at a time. Add the sugar or honey and stir it with your fingers or with a wire whisk to dissolve. Sprinkle the yeast over the surface of the water, and stir to dissolve. Wait about ten minutes for the yeast to begin to revive and grow. Skipping this step could result in making bagels with dead yeast, which will result in hard and potentially dangerous bagels. The yeast is good if it begins to foam and exude a sweetish, slightly beery smell. At this point, add about three cups of flour as well as the 2 tsp of salt to the water and yeast and begin mixing it in. Use your hands for this as you really get the perfect feel for the consistency of the dough. If you are not keen on using your hands then a wooden spoon will also work. When you have incorporated the first three cups of flour, the dough should begin to become thickish. Add more flour, a half-cup or so at a time, and mix each addition thoroughly before adding more flour. As the dough gets thicker, add less and less flour at a time. Knead the dough in a big and shallow bowl or on a clean, dry, flat counter top. Sprinkle your work surface or bowl with a handful of flour, put your dough on top, and start kneading. Add bits of flour if necessary to keep the dough from sticking to your hands, to the bowl or counter top. Keep kneading until the dough is nice and stiff. This may take 8 to 10 minutes. It will be quite elastic, but heavy and stiffer than a normal bread dough. It should not be too dry, however, it should still give and stretch easily without tearing. Place the dough in a lightly oiled bowl, and cover with a clean and damp kitchen towel. Swish the dough around in the bowl to coat the whole ball of dough with a very thin film of oil. This will keep it from drying out. Place the bowl with the dough in it in a dry, warm (but not hot) place, free from drafts. Allow it to rise until doubled in volume. Some people try to accelerate rising by putting the dough in the oven, where the pilot lights keeps the temperature slightly elevated. If you choose to do this, remember to leave the oven door open or it may become too hot and begin to kill the yeast and cook the dough. An ambient temperature of about 25 degrees C (80F) is ideal for rising dough. While the dough is rising, fill the stockpot with water and set it on the heat to boil. When it reaches a rolling boil, add the sugar (or malt syrup) and reduce the heat so that the water just barely simmers; the surface of the water should hardly move. Once the dough has risen, turn it onto the work surface, punch it down, and divide immediately into as many chunks as you want to make bagels. With this recipe, I got 12 bagels. Begin forming the bagels. There are two schools of thought on this. One method of bagel formation involves shaping the dough into a rough sphere, then poking a hole through the middle with a finger and then pulling at the dough around the hole to make the bagel. This is the hole-centric method. I used this method, as the dough is so easy to work with and allows you to shape and punch holes into the balls very easily. What I did was punch my thumb through the center of each roll and then rotated the dough, working it so that the bagel is as even in width as possible. The dough-centric method involves making a long cylindrical "snake" of dough and wrapping it around your hand into a loop and mashing the ends together. This method seems to be a little trickier as care must be taken that the ends do not come undone when boiling the rolls so, that you have bagel loafs instead of rolls. Remember not to give in to the temptation of using a doughnut or cookie cutter to shape the bagels. This will push them out of the realm of Jewish Bagel Authenticity. Do not worry if the bagels are not perfectly shaped or symmetrical. This is normal. The diversity adds to the rustic look of the bagels and each bagel is unique. Begin to preheat the oven to 200 degrees C (400F). Once the bagels are formed, let them rest for about 10 minutes. They will begin to rise slightly. Ideally, they will rise by about one-fourth volume. This technique is called "half-proofing" the dough. At the end of the half-proofing, drop two or three bagels into the simmering water, making sure not to overcrowd them in the pot. The bagels should sink first, then gracefully float to the top of the simmering water. Mine did not sink very much, they floated. But it did not bother me at all as I was so happy I had managed to get so far without blowing it. Apparently if they are "floaters", the texture is more bready rather than bagely. Let the bagel simmer for about three minutes, then turn them over with a skimmer or a slotted spoon. Simmer another three minutes, and then lift the bagels out of the water and set them on a clean kitchen towel that has been spread on the counter top for this purpose. The bagels should be pretty and shiny, thanks to the malt syrup or sugar in the boiling water. Once all the bagels have been boiled, prepare the baking sheets by sprinkling them with cornmeal. Then arrange the bagels on the prepared baking sheets and put them in the oven. Let them bake for about 25 minutes, then remove from the oven, turn them over and put them back in the oven to finish baking for about ten minutes more. This will help to prevent flat-bottomed bagels. Something I forgot to do! Remove from the oven and cool on wire racks. Do not attempt to cut them until they are cool. Hot bagels slice abominably and you'll end up with a wadded mass of bagel pulp. Don't do it. Bagels can be topped with anything you like. Just remember that bagels are essentially a savory baked good, not a sweet one, and so things like fruit and sweet spices are really rather out of place. I made my bagels with two types of toppings. I used my muesli mix and some hazelnut slivers. Mix of sunflower seeds, pumpkin seeds, soya kernels and pine nuts - this mix is what I usually make every weekend to add to my muesli/cornflakes during the week. After boiling but before baking, brush the bagels with a wash made of 1 egg white and 3 tablespoons ice water beaten together. 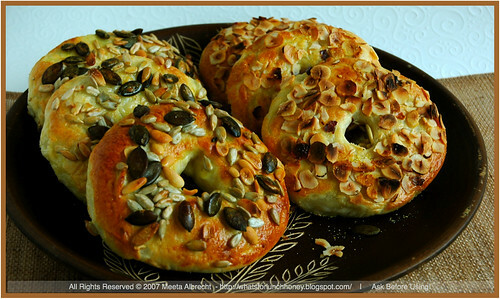 Sprinkle the bagels with the toppings and then bake in the oven. This was the easiest dough to make and to work with. I never thought it would be so simple. It rose beautifully and fast. I was expecting it all to be more complicated and also expecting a few things to go wrong along the way. I was worried about the yeast and then about forming them, then about boiling them. But it all went smoothly. Even the fact that the bagels did not sink when placed in the simmering water did not bother me too much. For this first time I was working for results. The next time I make these I will be working for perfection. In the taste department they were not that bready as I expected them to be due to the floating issue. They tasted great. As I said, I made these on the Saturday of my birthday. We had a few sleep over guests and on Sunday I served them for breakfast. I toasted a few in the toaster and re-warmed others in the oven. They were brilliant and my guests loved being pampered with fresh baked goods for breakfast. They were eaten with jams and honey, however I made a great filling for the bagels which was devoured to the very last bite. That will be revealed in a separate post! Yes, I would. I would not change anything here maybe cut the recipe in half for the three of us. Otherwise, this recipe is one that will be made often in my kitchen. Nothing like fresh homemade bagels. You know what? I will also be kneading with my hands the next time round too. No machine. There was something so therapeutical about kneading the dough. I was able to punch my frustration out. The bagels did not mind they still tasted fantastic. What I will do next time is to take more care by making sure I really get as much air out of the dough as possible to get them to really sink. Let's see how it work. I do not need to be frightened of yeast. Nor do I need to dread kneading. This challenge provided an easy and workable method, taking my fears of yeast away. As I mentioned earlier, the results was a wonderful dough that rose beautifully and was always easy to work with. Now, I am dying to try several recipes I put aside and feel confident enough to master a few. Am I still feeling invincible? I thank Quellia for this brilliant challenge. For all those who want to see the results of the rest of the group head on over to Quellia's or to co-host, Freya's for a roundup of this months challenge. Alternatively, you can simply click your way through my Daring Bakers blogroll. Hope you all enjoyed making bagels with us and I look forward to seeing you next month with a new challenge. 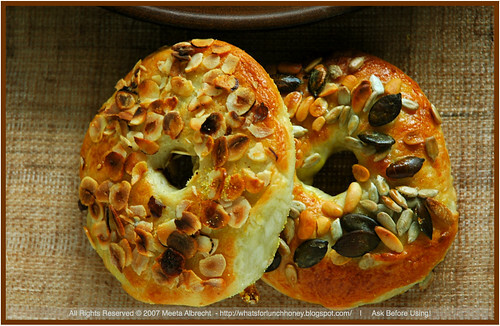 Great looking bagels Meeta! The historical lead-in was also very informative.And I like how you interspersed you actual experience withing the recipe. They look perfect! And I'm happy to see that we used partly the same toppings! You have such an exquisite taste baby! Thanks for the information on the Thompson Bagel Machine - I was worried about the pure Americans forming those bagels in early mornings to feed all those bagel-loving Americans!! I'll definitely be making them again too, yours are a thing of beauty as always Meeta! Meeta, I always love reading your posts. I always learn so much!! I do have to disagree with you about not having sweet toppings on a bagel. 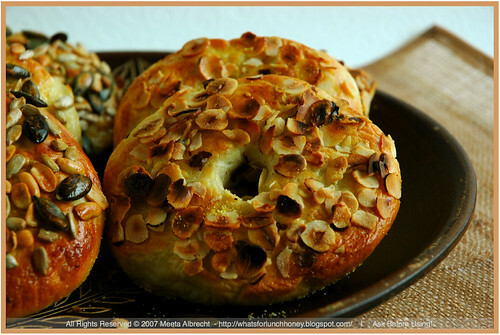 Although savory is my favorite, (asiago cheese in particular), cinnamon/sugar topped bagels come in second for me!!! I think you should feel invincible - all your creations are stunning, Meeta, and these are no exception! Your bagels look terrific! I love the idea of the Muesli topping. Thanks for the historical info. Meeta! 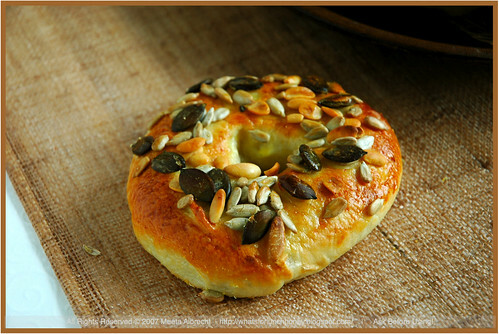 Your seeded bagels are so darling. I love that you've fallen in love with yeast and kneading (it made me sad that you were wary of the yeast beast). I also liked to all the interesting history. YEA for BAGELS!!! So glad we can always count on you Meeta to come up with the history! Fantastic Meeta! I'm so glad to hear that you bagels turned out so well - and the pictures prove it! Great work, and congrats on another fantastic DB challenge! Great toppings Meeta! Reall beautiful looking bagels. Can't wait for your secret filling post too. jai made these recently. bagels, in any avatar, are welcome. yours look perfect. 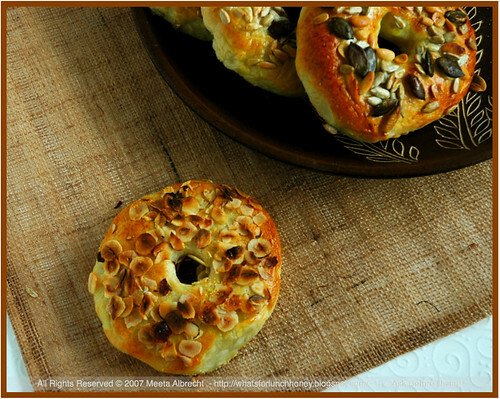 Great looking bagels Meeta and I love the hazelnut topping. Thanks for dividing the recipe in easy to follow steps, next time (yes there will be a next time soon) I will follow your lead. Never be afread of the yeasty monster again. I also brushed mine with the egg white , the toppings stuck nicely to the bagel and added that golden touch. Beautiful job! They look awesome! Nice job Meeta. Your bagels are beautiful. Like you, I am now less afraid of yeast. But I know we will conquer that realm too! Yes! Another yeast dough convert. Great post Meeta and I'm glad that you enjoyed the hand kneading. It really can be soothing/meditative. The toppings look great, too. These are beauties, I must say they are mouth-watering. Now I am also not gonna dread the yeast and should try making the bagels. Should I come over for breakfast? your post is very informative...and hazelnut slivers sounds really good...great bagels! 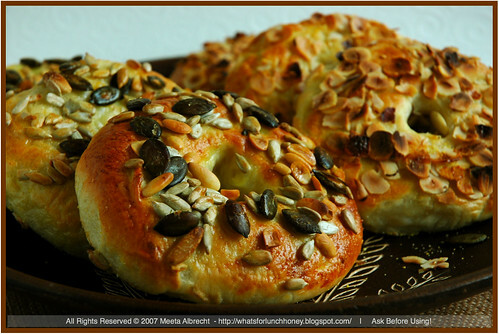 Nice looking bagels, Meeta! I love the hazelnut idea - in fact that was what I wanted to top mine with, but can you believe they are considered a "holiday item" here in sunny Florida?!? So I had to go with pignoli! Yours look amazing as always! Hi Meeta, I recently started blogging and read through some of your posts. Your recipes are very innovative. I am really scared of baking and have had a series of flops!! I hope that I can learn from your recipes. Especially inspiring are the mouth watering pictures in your posts. They must have been terrific with all those seeds, they sure look great. And thanks for the background info, I was completely clueless. 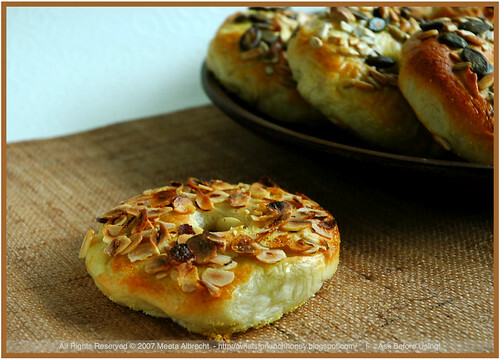 Meeta Bagels look perfect with their golden color. Nice to know history of Bagels too. Excellent and very informative post! I'm so glad you liked the bagels and I helped you conquer your fear of yeast! And I'd have been happy to be a guest in your home that morning! Great sounding bagels!! Am relying on your vivid write up and my imagination while saying that; Flickr is banned in UAE, so can't see those lovely pictures...boo-hoo!!! I love that you used pumpkin seeds. As always, you do such a great job of breaking everything down step by step. Excellent job. Thank you all! I really had fun with these and I loved reading about everyones experiences too. Yaaaahhh! To bagels. As for the next one - hmmmn - I already have the jitters as Peabody will be hosting! JyoThat really is bad. Which means that people in the UAE are all not seeing this. What a bummer. Although I had no complaints from my parents yet, who are also in Dubai! I will look into this and if required will discontinue using Flickr (with a heavy heart as the pictures are of a better quality using Flickr rather than uploading from Blogger)! Beautiful bagels! I'm sure the members of the bagel bakers' union would have been happy to welcome you as a member! I especially love the muesli mix bagels! I love the hazelnut topping you used. Great job on the challenge, the bagels look great! I noticed that even though my bagels floated they weren't as bready as I thought they'd be. Meeta, I'm like you. I kept expecting it to be more complicated but I'm absolutely thrilled that it's not. Now I feel like when I try it again I can concentrate on getting the shaping technique and exploring the topping ideas. The muesli was very clever! Your bagels look terrific. Using hazelnut was a great idea. I wish I could try them. These look mouthwatering! You are amazing Meeta! Lydia, you are too kind. We all are a great bunch! Bril, yup they were my fave too. Amy, same here - so we must have done something right LOL! Cynthia, sure I will. All you now need to do is get over here in time for breakfast! Glenna, I am looking forward to making these again. Let me know how your second batch went! KJ, thanks. They are so easy to make. I am sure you can give them another go. Susan, you are too kind. You'll probably be my only and exclusive customer! Rosa, Kanchana - thanks girls!